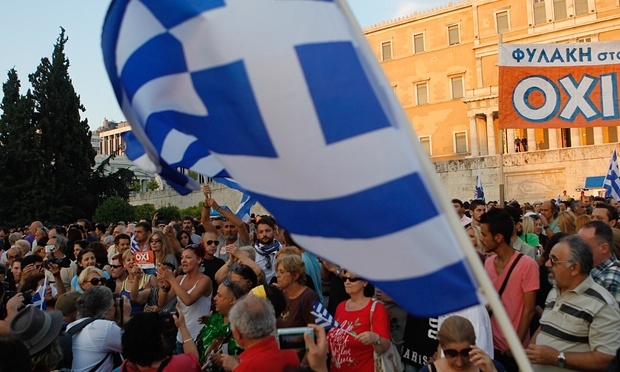 The Greek crisis exposes how the European Union has taken a wrong direction. The European Union was founded on principles of social democracy. Rooted in the Christian principles of “Rerum Novarum” the European experiment used to sit comfortably between the extreme worlds of US Capitalism and Russian Communism. It offered a particular type of bargain, with protections for those at the bottom of society, and controls on rampant exploitation of people and workers. In any politically led economic system we find politicians struggling to make sense of the complex interplay of economic factors. A populist politician is unlikely to have a PhD in economics. When politicians run into a capability gap they rely on specialist advisers. Ideally these advisers should be free of vested interests, and should give dispassionate counsel. At the most senior levels of the EU, and the respective national governments, we are seeing a different dynamic at play. In the USA the nickname for the Treasury Dept in the Whitehouse is Government Sachs or the “Goldman Sachs” dept, referring to the large number of treasury secretaries from that investment house. If you recruit stockbrokers to run government they create policies that favour the interests of big finance. They push for lower corporate taxes, they cut welfare, government spending and reduce government regulation of industry. These are exactly the forces we are seeing now in the European Union. The post 2007 austerity programme was a philosophy designed by bankers for bankers. For the average European the austerity programme has been a failure. For bankers it has been an unqualified success. The banking sector has recovered from near collapse, and the recovery has been paid for by ordinary citizens. At last the Greeks have called time on the troika of the IMF, ECB and the European Commission. Syriza was elected into power in Greece on an anti-austerity ticket. That should have been a warning signal to the troika. Instead of heeding the warning they blithely drove forward with their programme to steamroll the Greeks into paying banks back for bad loans. The troika have tried and tried again to bully Tsipiras and his party into submission. In response the Greek premier pulled out the most potent weapon in his arsenal “Democracy”. He is resorting to the will of the people to gauge their support for his non-cooperation with the austerity agenda. This does not sit at all well with the “Goldman Sachs” style banking & stockbroking mandarins who currently drive EU economic policy. They are not accustomed to having their policies questioned even by politicians. The concept of populist support is anathema to them. They have no time for debt forgiveness or for wishy-washy neo-Keynesian economic policies. The democratic prerogative should be no stranger to the politicians in the European Commission, the Council of Europe and the European Parliament. These are the people we have elected and appointed to guard the interests of the ordinary people of Europe. These are the people who are failing. They have given over too much power to the vested interests. A thin understanding of economics is no excuse for the abrogation of responsibility that we see in the politicians in Europe. The Greeks will speak on Sunday. I expect them to come back with a resounding no, OXI! Then we need to understand how we can help the economy at the bottom of our EU society. This is Europe, not the USA. This is about unification and inclusion, not about punishment and exclusion. It is time to fix the EU model. When you drive you drive alone. When you ride you are part of a tribe. As I cycled through Dublin earlier this week I observed something profoundly interesting. A lady on a bicycle had an accident. She caused the accident in fact. She broke a red light and cycled into a taxi that was turning right. She hit the front of his car from the side, tumbled over the bonnet and landed hard on the road. At this point I hopped off my bike, placed it against a lamp post and ran over to see if she was hurt. She was fine, just a little shocked. Then I looked around and realised that five or six other cyclists had done the same as me. She was surrounded by a lycra clad, high viz vest and bicycle helmet gang. The driver of the taxi stepped out of his car. Although he was totally in the right he was visibly nervous of the situation. He was in the right but alone. She was blatantly in the wrong, but she had a gang. Other drivers did not get out of their vehicles to support him. They were frustrated at the stoppage. They just wanted the accident cleared so they could get to work. One driver even began to honk his horn. This little moment highlighted for me the key difference between cyclists and drivers. 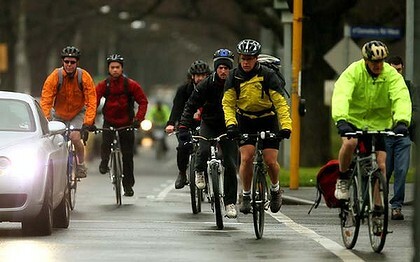 Cyclists are engaged in the real world. We are in constant danger from drivers and we can’t rely on the drivers to look out for our safety. Our lives are in our hands. As a result we are wide awake to our environment. We are not enclosed from the world, we are out in the open. We can make an easy transition from cyclist to pedestrian and back again. If something happens nearby the cyclist is part of it. If someone falls over they may check to see if they are OK. Drivers are enclosed in a glass and metal box. They are in their own private world. They look at our world through a window. They see it but are not part of it. They are physically and psychologically disengaged from the reality of life outside. They are possibly elsewhere, on a phone call, or listening to the radio. If someone falls nearby they observe it as though they are watching it on TV. It is not a part of their reality. Besides, it is a lot of trouble for a driver to disengage from the vehicle, to become a pedestrian, to walk over to the person who fell, and to see if they are OK. And if they do that the other drivers will get frustrated with you leaving your vehicle. They will honk at you to get moving again. It is easier to sit in your vehicle and wait for some passing pedestrian or cyclist to check out the situation. When a driver has an accident the other drivers nearby do not empathise with the driver. They do not get out of their cars and stand around in a group, unless it is a particularly unusual situation. in the normal day to day world of fender-benders you stay in your car and wait it out. If a cyclist is in an accident the situation is very different. Other cyclists seem to appear from nowhere. They come in droves. They are like white blood cells racing to a point of injury in the body. Before you know what has happened there is a gang of yellow, pink and orange people in strange space-age outfits. They identify with each other. They are a flock, a band, a gang. What is true for cyclists is doubly true for bikers, and may explain a lot about why biker gangs seem so threatening. Last night was St John’s Eve. In rural areas of Ireland it is bonfire night. This is a classic case of a pagan festival that the catholic church tried to muscle into the Christian sphere by shoehorning a Saint into the mix. It is remarkable in that it celebrates the birth of St John the Baptist. Most Saints and Martyrs are commemorated on the day of their death. St John’s day replaces a Celtic Summer Solstice festival which honoured the Goddess Áine. She was a goddess of light, fertility and kingship. The concepts of fertility and kingship were inexorably linked in the Celtic pantheon. The Lammas Kings (also known as Corn Kings) were “married” to the land (and celebrated at Lughnasa). They lived the high life as long as the land produced. But they typically reigned for only seven years. In some traditions the king was sacrificed for the continued fertility of the land. In other traditions young clansmen could compete for the opportunity to challenge the corn king in single combat to the death. It is easy to see how this ancient tradition of Kings tying their lives to the fate of the people could be molded and replaced with the central mystery of Christianity, a saviour who dies on our behalf. The festival of Áine was marked by bonfires lit on the solstice, the shortest night of the year. The Christian festival shifted out three days. Who knows why? Maybe to separate the Christian and Pagan traditions? To identify those holding on to the old ways, so they could be targeted for conversion? In the Pagan Lammas tradition the Solstice might have represented the last celebration of the existing Corn King, before he faced sacrifice or replacement. 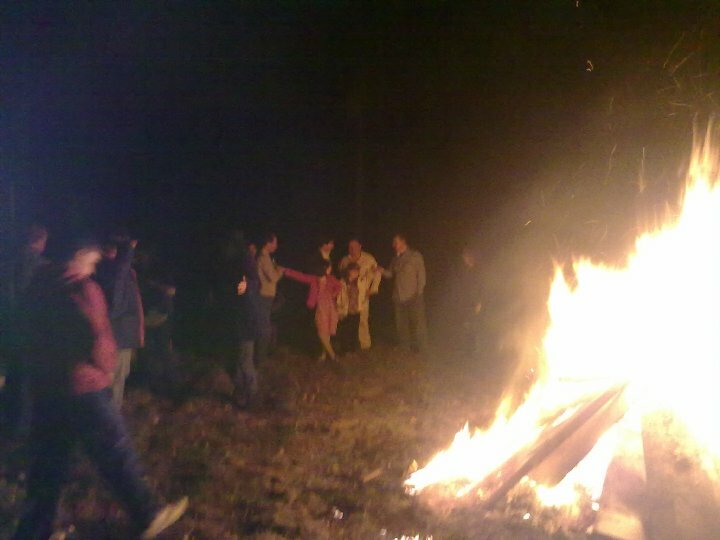 Indeed the bonfire tradition may have originated from the sacrifice of the Corn King. There are many details of Celtic religions lost to us because they were not documented, and they were expunged by Christian proselytisers. 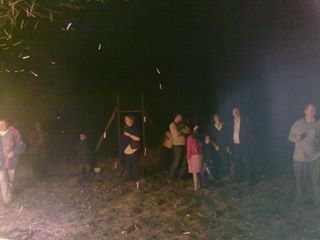 So if you want to celebrate with a bonfire on St John’s Night go to the most rural areas of Ireland. Go west! I turned into an Etymologist today. 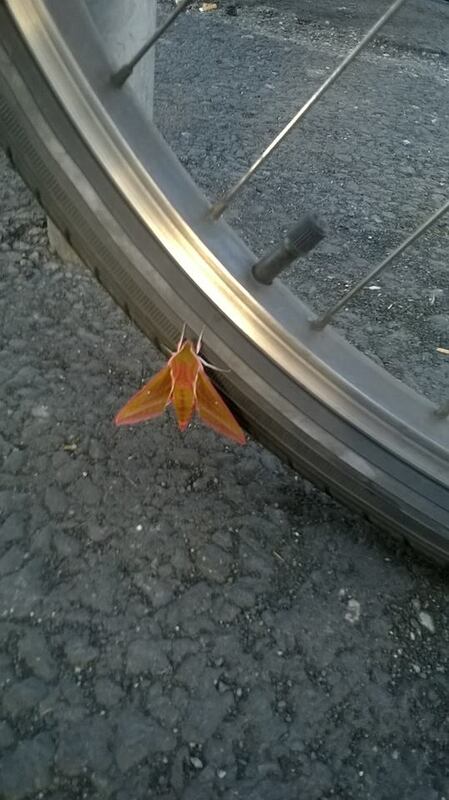 Found this monster on my bicycle this morning. 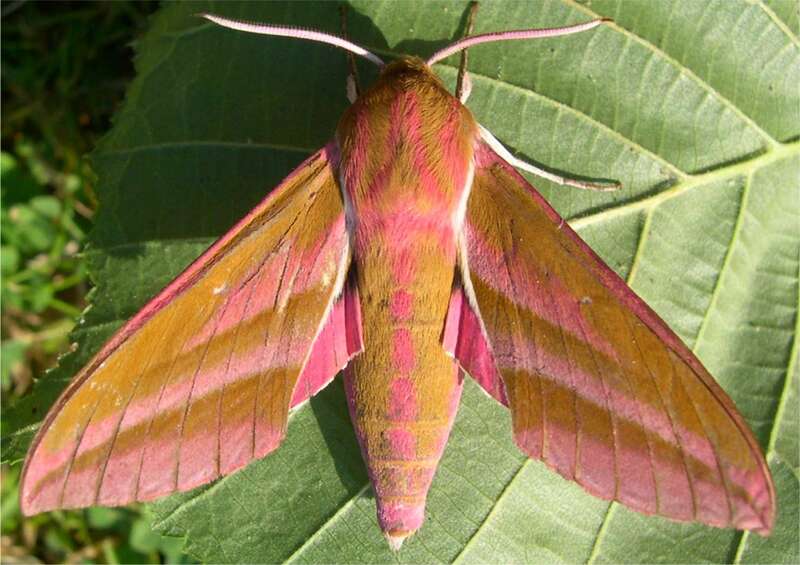 From the benefit of my many seconds of experience and a knack for using Google I would say it looks like an elephant hawk moth. My camera phone is not exactly brilliant for this kind of thing, so I attach a better photo from the Internet. Really beautiful moth. He gets the “Elephant” part of his name because as a caterpillar his mouth looks a bit like an elephant trunk. I didn’t know that five minutes ago. But then, five minutes ago I didn’t know anything about this amazing creature. Ain’t life great, every day is a day at school! Spare a thought today for Muslims living in Ireland. Ramadan begins today at the height of the Irish Summer. There are 50,000 muslims in Ireland. They are not supposed to eat in the hours of daylight. Daylight is defined as when you can tell a black thread from a white one. That means they can’t eat or drink from 3am until 11pm. So they go 20 hours of the day with nothing to eat or drink. 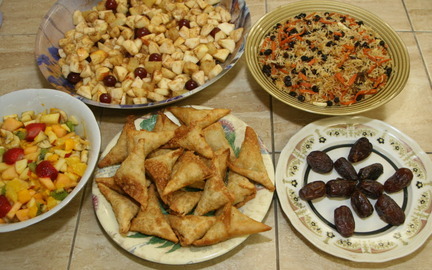 They need to wait until 11pm at night before they can sit down for the iftar meal and then, they have to rise only a couple of hours later at 2am if they want a bite of breakfast at suhoor. The only way to cope with this situation is to sleep in the early evening when you come home from work. Then dine through the late hours of the night and then go back to bed just as the sun begins to rise again. Honestly, I don’t know how you are supposed to get through a working day like this. The 16th of June was the first day that James Joyce went out on a date with Nora Barnacle, who later became his wife. Joyce then chose this day, in 1904, to be the canvas for the events that unfolded in his Opus Magnum, Ulysses. The central character of that novel was Leopold Bloom, and the name Bloom’s Day derives from this source. Today Bloomsday is a world wide celebration which usually involves dressing up in Fin de Siecle garb, impersonating James Joyce, re-enacting scenes from Joyce Novels, consuming the inner organs of beasts and fowls, cycle rallies on old style delivery bicycles, wearing sandwich boards, interminable readathons and generally hanging around in groups speaking in vaguely intellectual terms. It was a beautiful sunny day today in Dublin and I took a stroll down the canal to the Patrick Kavanagh Lock. The poet wrote the following lines when he was alive. After he died his friends erected a bench in his favourite spot on the Grand Canal, just off Baggot Street. 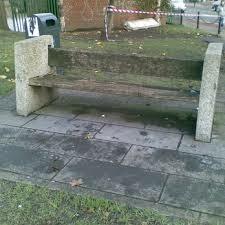 This is the bench below. To be honest it is a bit worn and scruffy. But that is the true memorial to Kavanagh. 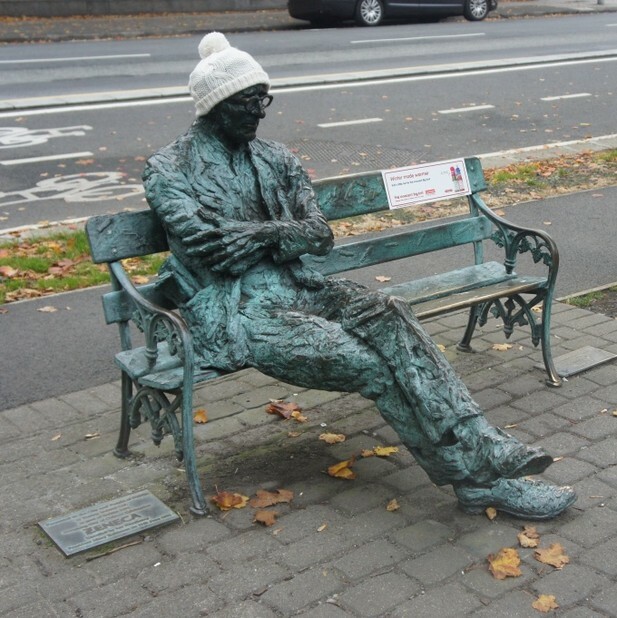 However, there is now also a statue of Kavanagh sitting on a bench very near to the memorial. It now seems to attract all the attention at the site. Today I saw some American Tourists trying to take photos of the statue. They seemed to be upset because there was a girl sitting on the bench eating her lunch and there was a guy sitting on Kavanagh’s knee talking to her. They probably felt this was a bit disrespectful of the artwork. Me, on the other hand, I think it is great. I love to see art that people engage with. There is no doubt that Irish people love Kavanagh as a poet and we respect his work. But we also love him for his accessibility, and this translates into the way people engage with his statue today. They dress him with hats, or rain-gear. They paint his shoes red. They put scarves around his neck. They put their arms around him and have their photo taken. This is street art, living art, relevant art.